The Shams solar power station is being built in the city of Madinat Zayed, located 120km south west of Abu Dhabi, in the United Arab Emirates. Construction of phase 1 of the solar project, Shams 1, started in July 2010 with operations commenced in March 2013. Shams 1 is the first solar farm in the Middle East and the largest concentrated solar power (CSP) plant in the world. 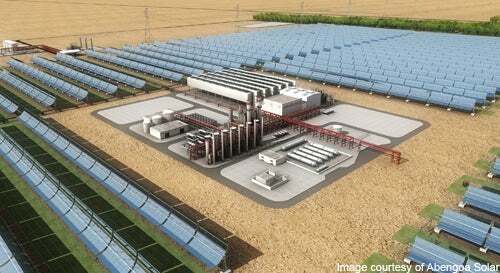 The Shams solar power station is being built in the city of Madinat Zayed, located 120km south west of Abu Dhabi, in the United Arab Emirates (UAE). Construction of phase one of the solar project, Shams 1, started in July 2010 and operations commenced in March 2013. The $600m Shams 1 is the first solar farm in the Middle East and the largest concentrated solar power (CSP) plant in the world. The electricity generated by Shams 1 is sufficient to power 62,000 homes and is currently sold to the Abu Dhabi Water and Electricity Company (ADWEC) under a long-term sales contract. "The $600m Shams 1 is the first solar farm in the Middle East and the largest concentrated solar power (CSP) plant in the world." Shams 1 displaces about 175,000t of carbon dioxide, which is equivalent to planting 1.5 million trees or removing 15,000 cars from the roads of Abu Dhabi. The plant is owned and operated by Shams Power Company, a consortium of Masdar (60%), Abengoa Solar (20%) and Total (20%). Abu Dhabi-based Masdar promotes renewable energy in the Middle East. Shams 1 was the company’s second project registered with the UN and the first approved CSP plant under the clean development mechanism (CDM). The plant earns carbon credits under the UN’s CDM. It was also approved by the Government of Abu Dhabi for a solar incentive programme in the form of a long term Green Power agreement. The project attained its financial closure in March 2011, when Shams Power Company raised $600m from ten regional and international lenders – BNP Paribas, KfW, Mizuho, SociétéGénérale, The Bank of Toyko-Mitsubishi, National Bank of Abu Dhabi, Union National Bank, Natixis, Sumitomo Mitsui Banking Corporation and WestLB. Mott MacDonald was the lenders’ engineer. The first invitation to bid for the construction of the CSP plant was made in 2008. In addition to Abengoa Solar and Total, Saudi Arabia’s Acwa Power International, Iberdola, Grupo Cobra, Grupo Sener, Germany’s MAN Ferrostaal and Solar Mellinuim also participated in the bid. The bid selection process was delayed for two years. The design, build and operate contract was finally awarded to Abengoa Solar and Total in June 2010. The contract is valid for 25 years. Abener and Teyma, both subsidiaries of Abengoa Solar, constructed the turnkey Shams 1 plant and Germany-based Man Turbo supplied the steam turbines. The Shams 1 CSP is spread over an area 741 acres or 2.5km² of desert and features 768 parabolic trough collectors over 6,300,000ft² of land. The parabolic trough collectors collect sunlight and convert it into thermal energy. The heat collected generates high-pressure steam with the help of a coolant present inside the tubes of the solar panels. The 125MW steam turbines rotate with the help of the pressure to generate electricity. Abu Dhabi has an installed capacity of 10,000MW and the power consumption is expected to rise by 3.5 times its current levels of 7,602MW. "The plant is owned and operated by Shams Power Company, a consortium of Masdar (60%), Abengoa Solar (20%) and Total (20%)." The rise in consumption is due to the fact that the city also exports electricity to the Northern Emirates and Dubai. Around 1,356MW of power was exported to the two emirates in 2009, an increase of 502MW from the previous year. Peak electricity demand of the UAE increased by 7% from 14,385MW in 2008 to 15,426MW in 2009. Electricity consumption in Abu Dhabi is also expected to increase to 15,069MW by 2015. In order to meet the future electricity demand, the UAE Government has rolled out a programme that aims to produce power through renewable energy sources such as solar and nuclear power. It aims to achieve 7% of renewable energy by 2020. The power sector in Abu Dhabi is expected to expand further with the development of power projects such as Shuweihat 2, Shuweihat 3 and Taweelah C.
While there were many power projects scheduled to be executed during 2011-2012, a few of them had to be shelved indefinitely due to the global economic crisis. Solana Solar Power Generating Station, with an output capacity of 280MW, is one of the largest concentrating solar power (CSP) plants in the world. The 143MW Catalina Solar Project, located in Kern County of California, was developed by EDF Renewable Energy (formerly known as EnXco).